Beautiful, bounty-filled photograph and words. How peaceful to embrace the moment and be one with it. It is a wonderful feeling to be in the moment of one’s task! I tidied up the counters and moved many tomatoes in a clear glass bowl. I also chopped up many for the freezer. Each task was delightful! 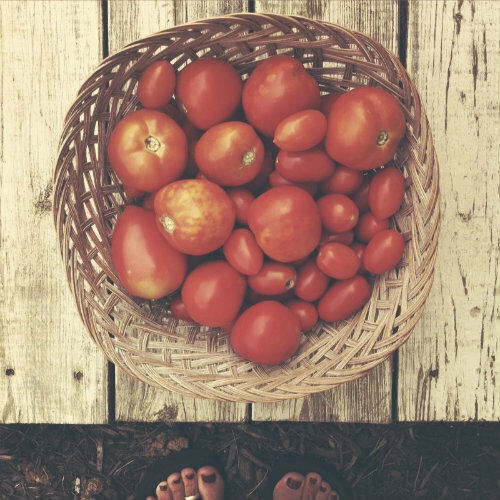 Your tomatoes are beautiful and really a labor of love, enjoy. Stillness and beauty wrapped up in three verses, a wonderful moment in my day. Sometime in the future, I picture myself holding a book of collected poems, all written by you. Keep writing Michelle, your work is a joy to read. Thank you. Michelle, your words, your images. They both have a way of calming me, nurturing me. And yes, I too can picture myself holding a book written by you … and a treasured book it would be.